Whether your style is country or coastal, the Riviera indoor/outdoor stacking side chair is a colorful solution to extra guest seating. 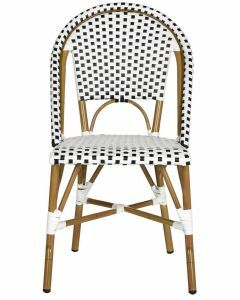 Inspired by classic European bistro chairs, the pretty and practical Salcha is crafted of yellow and white PE wicker and aluminum faux bamboo for easy care. The chair measures 18" x 21.6" x 34.6". and the seat measures 17.3"H. Clean your Wicker furniture with a small amount of mild soap and warm water and rinse with a garden hose and allow drying before replacing any cushions or pillows. Outdoor Wood Furniture. Most outdoor furniture is finished with several coats of exterior varnish so it is easily clean without damaging the wood finish. Store outdoor furniture indoors or cover well when not in use. Dust regularly with small brush or vacuum. Spills should be taken care of immediately before they harden or stain with a slightly dampened sponge. Click images for greater details.